This is a lengthy unit which covers ecology, biomes, energy transfer, and relationships. This unit will be project based. Please check the specific tabs under this page for more information. ​This unit will run through the end of April. S7L4a. Demonstrate in a food web that matter is transferred from one organism to another and can recycle between organisms and their environment. S7L4b. Explain in a food web that sunlight is the source of energy and that this energy moves from organism to organism. ​S7L4c. Recognize that changes in environmental conditions can affect the survival of both individuals and entire species. ​S7L4d. Categorize relationships between organisms that are competitive or mutually beneficial. ​1. How is the environment organized? 2. How does energy flow through an ecosystem? 4. 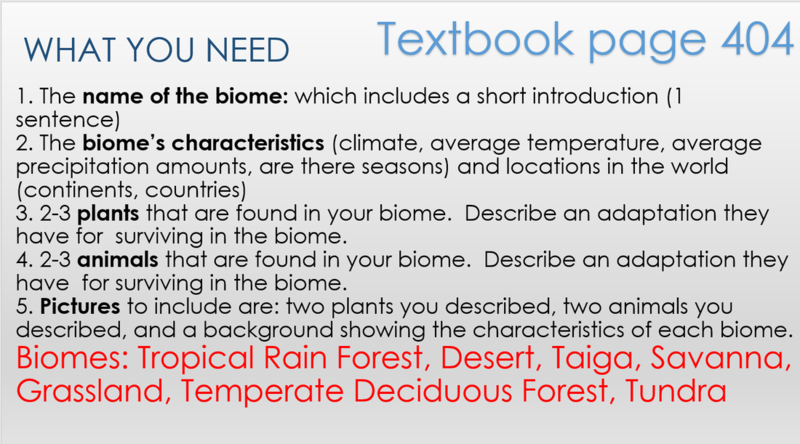 What are the characteristics of the Earth’s major terrestrial biomes? 5. What are the characteristics of the Earth’s major aquatic communities?